This issue discusses imaging techniques for common and important lower extremity injuries and conditions. Femoral acetabular impingement, soft tissue pathology around the hip, meniscal injuries and imaging the postoperative meniscus, the neglected corners of the knee (posterolateral / posteromedial corner injuries), the extensor mechanism from top to bottom, cysts and bursa around the knee, ligamentous injuries of the ankle and foot, medial longitudinal arch of the foot, ankle impingement syndromes, imaging of the forefoot, overuse injuries of the lower extremity, imaging of total hip and knee arthroplasties are all reviewed. 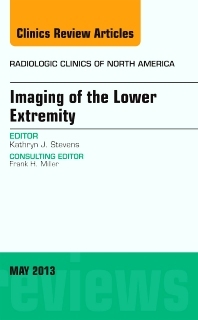 Additionally, the application of advanced imaging techniques in evaluation of the lower extremity is discussed.